Induction heating is the most progressive method for brazing of squirrel cage (SC) type rotors of electric motors. Frequencies from 3 to 10 kHz are typically being used for brazing of relatively large rotors (diameter more than 200 mm). If the ring thickness exceeds its height, flat single or two-turn inductors with concentrator are located under the ring instead of the round coil surrounding the ring. The rotor is standing on the top of the coil providing high pressure onto the joint components; a gap between the coil and ring is minimal and constant during the heating process. 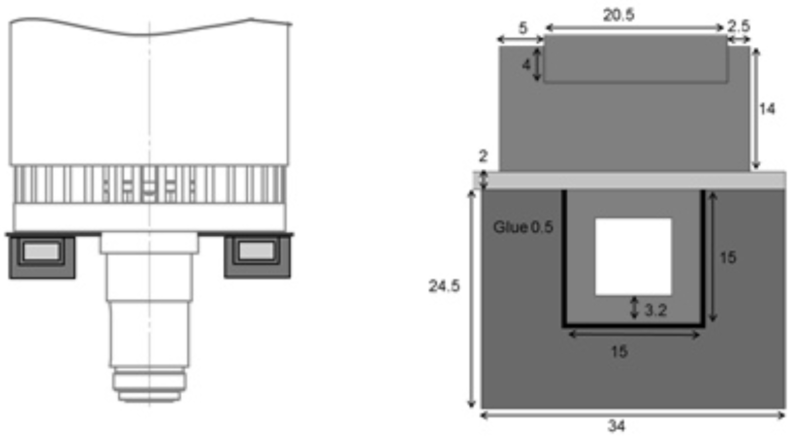 This study describes a modified system with concentrator made of magnetic composite Fluxtrol 100. Frequency was much higher (around 50 kHz) than traditionally used (3-10 kHz). Electromagnetic and thermal coupled simulation with Flux 2D used to compare the process parameters and temperature distribution dynamics at 3 and 50 kHz. It was found that at higher frequency the brazing quality and time are approximately the same as at lower frequency. Electrical efficiency is slightly higher at 50 kHz while the coil current is significantly lower. Computer simulation at different powers showed that for a larger rotor the minimum required power is 70-75 kW. At lower power brazing time quickly increases and at 50 kW reaches 16 min instead of 5 min at 75 kW. Electrodynamic forces between the coil and rotor at 75 kW equal to 250 N at 50 kHz and almost 950 N at 3 kHz. 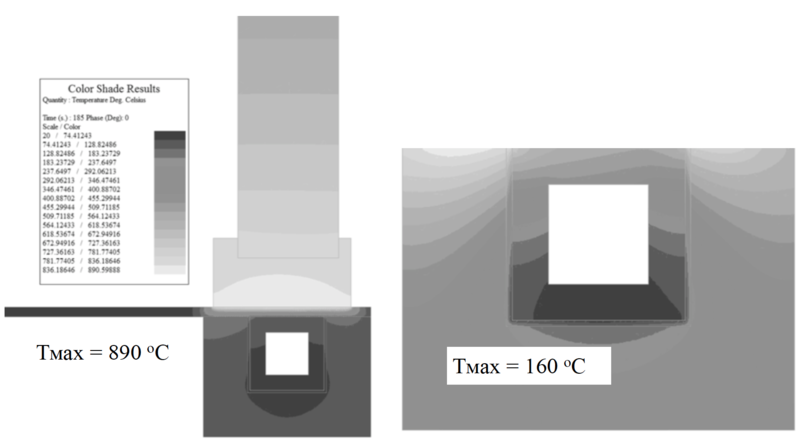 Thermal simulation of the coil proved that the maximum temperature of Fluxtrol 100 concentrator is below 200 C, which is acceptable for this material. Experimental and then industrial tests confirmed the results of simulation. The research was conducted for two SC rotors typical for tram and trolleybus traction motors. Similar motors are used as a part of the wheel drive of electric trains and subway cars, in dump trucks, etc. Despite rather simple geometry of the system and non-magnetic material of details, the task is rather difficult for accurate modeling. First of all, existence of discrete rods doesn't allow the use of 2D modeling without considerable assumptions. Secondly, thermal contact of rods and ring isn't ideal. Different rods can have varying thermal contact, which can also vary during the brazing process. When the brazing temperature is reached, thermal contact considerably improves. Thirdly, heat conductivity from the rods to a package of steel on the rotor is poorly defined. Therefore it is important to compare results of calculations to experimental data. The coil design for heating of SC rotor rings depends on the ratio of height (H) of the ring and its thickness (B), where B=0.5 (OD - ID). When H ≥ B, external single turn or multi-turn induction coils are usually used. These inductors don't carry mechanical loading from rotor weight, and thermal isolation can be improved. In cases when H ≤ 0.5B heating is usually made by a bottom coil. Single-turn or pancake style coils are used. In this case for higher efficiency it is necessary to use magnetic field controller (concentrator). The magnetic controller can be made from laminated steel or from magnetic composite material (MCM). In this work Fluxtrol material was used. The various Fluxtrol materials can be used both for low, middle and high frequencies [1,2,3]. They are perfectly machinable and, unlike steel, don't demand expensive equipment for lamination stamping. It is possible to use the C-shaped Fluxtrol LRM (Laminations Replacement Material) concentrators intended for direct replacement of laminated magnetic concentrators. These concentrators are much less labor-consuming in production. At frequencies below 20 kHz it is recommended to use Fluxtrol LRM LF, at higher frequencies – LRM MF and HF. The research of frequency influence on brazing quality and equipment productivity was one of the main objectives of this work. Frequency and current has to be such to provide sufficient heating of the brazing connection, acceptable efficiency, and also correspond to the existing equipment and equipment safety requirements. Some other researchers use for rotor brazing a frequency in a range of 9 – 23 kHz . Cases of application at lower frequencies of about 2-3 kHz are also seen. The authors of this paper made an attempt to approve this technology on "high" frequency and to compare the results to "low" frequency. The copper ring with groove is placed on the inductor covered with a thin layer of thermal insulation (Fig. 2). A ring of flux is placed into the groove. The rotor is put vertically with the bar ends positioned into the ring groove. Solder is put in a groove between the bar ends. The ring and the ends of bars are heated in the induction coil. Solder melts, spreading along the whole groove and wets the ends of bars. After cooling a reliable solder connection is formed. Then the rotor turns over and the process repeats similarly for the second ring. 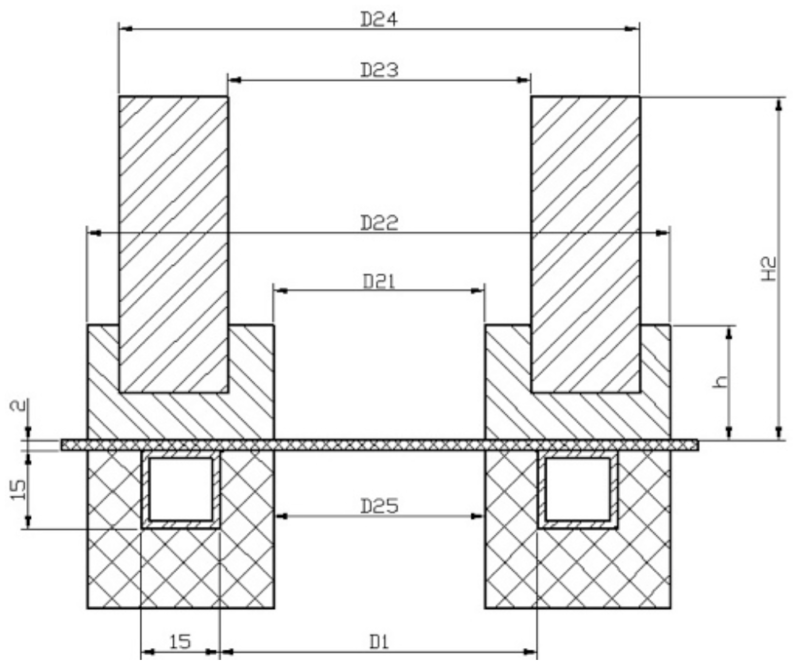 Figure 2: Sketch of the rotor with the inductor: D1 - diameter of the coil, D22 - outer diameter of the ring, D21 - inner diameter of the ring, h - height of the ring. 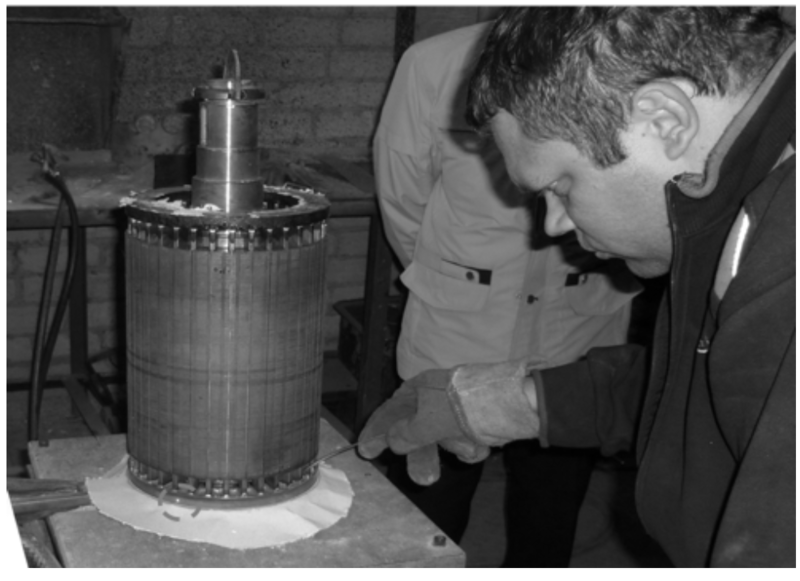 Experiments were carried out on an installation for brazing SC rotors using a transistor generator type VGT6-60/66 with a power of 60 kW and with a frequency range of 40-80 kHz, used also for the induction heating of other details [5,6]. In experiments frequency was in the range of 45-55 kHz. The brazing was carried out with silver solder PSR45 which has a melting temperature in the range of 660-725oC . For good spreading of solder and formation of a high-quality solder connection, the copper ring has to be heated to temperature above 800оC. The one turn induction coil has Fluxtrol LRM MF C-shaped concentrator pieces attached to the inductor using glue with a thermal conductivity of k = of 0.05 W/cmK. The insulating layer between the inductor and a ring is made of mineral felt with a thickness of 2 mm and thermal conductivity of k = 0.002 W/cmK. Temperature of the ring was controlled by a pyrometer. The photo of SC rotor brazing of the ATD-3 motor is shown in Fig. 3 at the end of heating when the solder has melted and spread inside the ring forming fillets on the bars. The operator checks the spreading of solder on the perimeter of the bar, and if necessary adds the solder by placing a rod on the line connecting the ring with the bar. The set of the rotor bars have been replaced with a tube filling the whole groove. Thermal conductivity and heat capacity of the tube material were reduced by 2.4 times to account for incomplete filling of the ring around the perimeter by the rods. Coefficient 2.4 equals to a ratio of cross-section of equivalent tube and bars. Thermal contact between tube and ring was ideal. Heating continued until an optimal for brazing temperature of 850 C reached on the rod ends. Constant voltage was applied to the coil head; this voltage must correspond to a selected mean power during the brazing process. Two frequencies (50 kHz in case 1 and 3 kHz in case 2) and two power levels (50 and 75 kW) have been selected for simulation. Figure 4: Temperature distribution in the brazing area of rotor ADT-3 at the end of heating (left) and in the induction coil (right), temperature on a joint is in the range of 800 - 850C. As seen in Table 2, the data from simulation and experiment are in good agreement. In spite of the assumptions made, temperature was reached at approximately the same time both in experiments and simulation. For example, the heating time for the brazing of rotor ADT-3 at a power of 50kW was 170 s in experiment and 185 s in simulation. Changes in the inductor power and temperature during heating are shown in Figure 5. The graphs show that at constant coil voltage the coil power initially rapidly grows from 33 to 42 kW, and then increases slowly, reaching 55 kW at the end of heating. This is due to a significant increase in the resistivity of copper rings (about 4 times from room temperature to 800°C). Notations used in Table 2: Pc - power in the inductor, P1 - power loss in the coil, P2 - power in the ring of the rotor, PM-losses in the magnetic concentrator. It is very important that heating to the brazing temperature takes approximately the same time at a frequency of 3 kHz and 50 kHz (185 and 205 seconds, respectively, for ADT-3 rotor). This means that for a given brazing process frequency is not a determining factor for the coil efficiency. The simulation resultsof the brazing cycle for rotor ADT-3, including cooling, are shown in Fig. 6. Immediately after turning the power off the heating temperature falls rapidly, with almost the same speed as it increases during the heating. This means that the thermal efficiency of the process at the end of heating is about 50%. Figure 6: Temperature change in the joint area of the rod and the ring during heating and cooling (left) and vertical forces acting on the rotor at 50 kW power (right). When the power is significantly lower than the optimum value (50 kW instead of 75 kW for DTA-1), brazing can be made, but heating time increases dramatically (930 s instead of 310 s), the rotor laminations may be heated to an unacceptable temperature, and the brazing quality may be lower due to long exposure of solder to a high temperature. Although temperature uniformity in the joint area at 75 kW is lower than at 50 kW, brazing quality is good. It is important to note that the coil temperature remains within acceptable limits (Fig. 4) without additional measures of temperature control. The maximum temperature of concentrator is 160oC, which is quite acceptable for the Fluxtrol material. At 75 kW the maximum temperature of concentrator reaches 200 ° C, which is still acceptable for the material Fluxtrol (Tmax = 250oC in continuous operation). If necessary, the temperature of the concentrator can be lessened by reducing the gap and using glue with higher thermal conductivity, e.g., epoxy Duralco 4525 with thermal conductivity 0.02 W/cmK. From modeling the electrodynamic forces acting on the rotor and the coil are calculated (Figure 6). With an output of 50 kW and a frequency of 3 kHz, the total force is almost 700 N, and at 75 kW - 1000 N. This force is not sufficient to lift the rotor, but it leads to mechanical vibrations and significant noise. At 50 kHz, the corresponding forces are 160 and 240 N. The noise is completely absent due to the small force and high frequency in this case. This is also an advantage of heating at higher frequencies. Brazing of SC rotor rings in many enterprises is one of the bottlenecks in the production of electric motors. Induction heating is a progressive method of brazing, providing high quality, absence of strain, quick process, and good working conditions. Induction heating for brazing SC rotor motors can be effectively performed using not only medium but also higher frequency power supplies, which reduces the dimensions, weight, and load of installation. When heating at frequencies above what is audible, working conditions improve for staff, since there is no characteristic audio noise compared to operating at low frequencies. Also, the use of concentrator reduces the magnitude of the magnetic field radiation around coil. Application of magnetic concentrator improves efficiency and reduces the current in all elements of the main circuit power supply. For rotors of medium and large size it is advisable to use the bottom coil, separated from the rotor with thin insulating layer. Such coil design makes easy installation of rotor on the inductor, provides a constant gap in the heating process, and is independent of the thermal expansion of the rotor ring. Magnetic controllers may be made from a composite material Fluxtrol that simplifies production of the inductor and ensures reliable functioning, especially at frequencies over 10 kHz. Experience has shown that these materials maintain the thermal and mechanical loadings arising at the rotors brazing process. Despite a number of the assumptions made in the modeling, the results agreed well with experimental data. Modeling can be used to accurately choose the frequency and power supply capacity, to define time of heating and inductor parameters that are important for matching with the generator. Vologdin, V., Vologdin. Vl., Jr. (2011). Inductors with Fluxtrol magnetic material when operating at 66 and 440 kHz. Induction Heating, no. 2 (16), in Russian. Nemkov, V., Goldstein, R., Jackowski, J., Vyshinskaya, N., Yakey, C. (2010). Composite Magnetic Materials for Hardening Inductors: The calculation of temperature and cooling methods. Induction Heating, number 2 (12) , in Russian. H.-J. Peter. (1998) Perfektes Löten mit mobilen Induktionservärmungs-anlagen. Schweißtechnik. DVS-Verlag, Düsseldorf. Vologdin, V., Vologdin, Vl., Jr. (2012) The development and implementation of high-frequency transistor generator series VGT in induction heating installations. Induction Heating, number 3 (21), in Russian. Handbook of soldering. Edited by I.E. Petrunin. Third Edition, M. "Engineering", 2003.